505 Ocean One: Direct Oceanfront BY OWNER! Great Spring & Summer availabilities. PLEASE DO NOT RELY ON THIS SITES PRICING FOR STAYS UNDER 7 NIGHTS OR MID-WEEK ARRIVALS / DEPARTURES. PLEASE REFER TO OWNER MESSAGING FOR CORRECT RATES AND AVAILABILITIES PRIOR TO BOOKING REQUESTS. THANK YOU..... Chuck. WELCOME TO OUR DIRECT OCEANFRONT VILLA LOCATED AT 'OCEAN ONE'. I am CHUCK - HILTONHEADSCRENTALS. Modern and clean kitchen cabinets, top of the line silestone countertops, excellent condition appliances, wood floors throughout Kitchen, Foyer and main living Area, carpeted bedrooms. New master bedroom & living room furniture. Modern and well kept bathroom vanities and fixtures. This villa is a '10'!!! 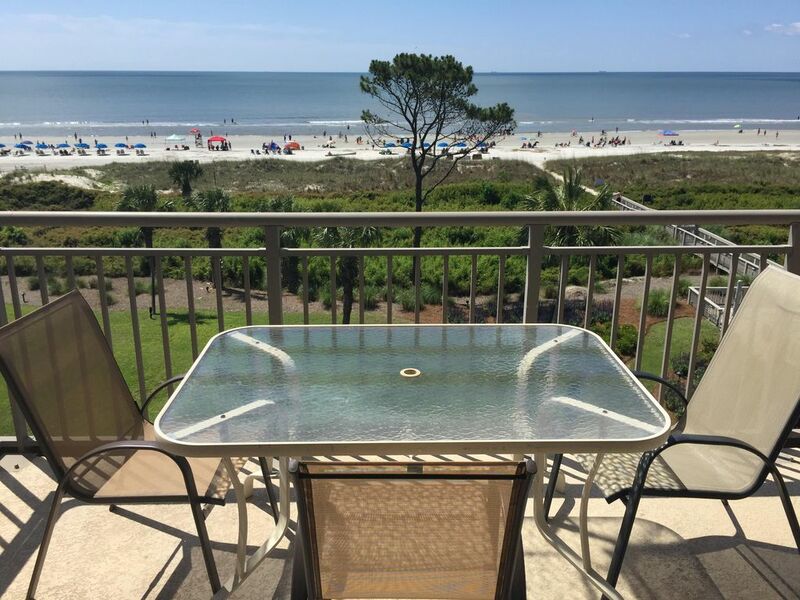 You will not find a Villa on Hilton Head Island with a better unobstructed, panoramic and direct Ocean View! This lovely Villa sits on the top floor of a five story complex located next to Coligny Plaza. Enjoy the full oceanview over miles of water and hear the waves crashing. There are two separate oceanfront balconies... one off of the main living room and the other adjoining the master bedroom. The building has elevator access with luggage carts. This 1280 sq ft villa features a fully furnished kitchen, sizable living and dining area, two spacious bedrooms and two full baths, as well as a queen-size sleeper sofa. The master bedroom has a king sized bed while the second bedroom is furnished with a queen sized bed. Pets are not allowed and this is a non smoking unit. This property is located in the popular Forest Beach area with miles of paved bike and walking paths right across the street. Walk (or take the elevator) downstairs to the beach or beautifully maintained pool surrounded by manicured lawns and landscaping. Walk next door to the Holiday Inn where you can rent beach equipment, grab lunch at the poolside grill or enjoy your favorite beverage at the outdoor Tiki Hut. Coligny Plaza is a short walk away and famous for it's over 60 shops and restaurants. An abundant amount of top quality island golf courses are minutes away. Its the perfect location for a perfect vacation! Conditions: This unit is a non-smoking Villa with no pets allowed. 30% Deposit plus refundable security (1st time guests only) required to reserve. Must be occupied by an Adult 25 years or older. All Rates include cleaning services. 10% South Carolina tax additional. We have owned and rented Hilton Head properties since the Summer of 2000. We are excellent at providing our guests with a simple, friendly and courteous rental experience. In reality, we understand that your vacation does not start on your arrival date. It starts at the planning and accommodation selection stage. We promise to represent our properties honestly and provide you with an excellent value. This means your vacation experience will be enjoyable from beginning to end. Bluetooth Speakers. Will 'Pair' with virtually every Bluetooth capable device to include Cell Phones and iPads. Plenty of Local Bike Rental companies that deliver and pick up when finished. We enjoyed our week in this unit! The view was spectacular! The condo was fully equipped with everything we needed, and was beautifully decorated. The live music from next door added a nice touch in the evenings while we relaxed on the large patio. We love visiting Hilton Head every chance we get, and will plan future visits around the availability of 505 Ocean One!!!!! Mandy, Thank you for this 5* review and your kind comments. We look forward to having you back on a future visit to HHI. You were great guests!... Chuck D.
Having never visited the southern end of Hilton Head, I shopped reviews very carefully before selecting Ocean One 505. Everything everyone has posted is true. Unit was clean and spacious. Chuck called to insure everything was in order. View was excellent, as was the convenience of being able to walk to stores and eateries. The live music next door was a welcome addition for our family, and we could watch the band from our balcony. Would definitely recommend , and look forward to booking this unit again. The place was great with a beautiful view and chuck was more then accommodating. Our family has been vacationing in HH for many years. What we love is a smooth, trouble free vacation. From the time we hit the "send button", Chuck was excellent in communication, paperwork, and information to get us going. Our trip this year was BY FAR the best experience to date. Folks, location, location, location. This property located direct waterfront and on the fifth floor offers the best of the best. The elevator is great, parking steps away from the elevator and the property has large hotel luggage racks that you can take from the parking lot right up to the door at the unit. This unit has the best views of the pool and the ocean. The fifth floor offers great sunrise views overlooking the pool and ocean. When staying on an island you should hear the ocean. Just open the slider in the living room and feel the ocean breeze and listen to the waves at the beach. Awesome!!! Our kids rented bikes and off they went to shopping, to restaurants and sights all along the Coligney area. The condo is totally as described and more! When looking to rent, look no further- take it from someone who knows the island inside and out. Thank you Chuck for offering this property and look forward in booking again. Mike and Cathy D.
We recently stayed at Ocean One unit 505 ocean view June4/10th everything met our expectations modern clean plenty of room. The pool area was excellent and all of the surrounding ground were immaculate. Chuck was great to work with keeping in touch to make sure everything was going well for us. I would definitely rent one of Chucks units again. This is a Non - Smoking, No Pets allowed Villa. Must be occupied by an adult 25 years or older. Security Deposit is required (1st time guests only).